Scanning document feature allows you to scan and store documents within Docsvault repository. Docsvault is designed to work with all TWAIN scanner. Docsvault's inbuilt scanning window has all of the essentials features for good quality of text recognition. Built in image processing filter includes lots of post scanning tools to improve image quality such as despeckle, eraser, crop, brightness, contrast, erode, dilate, etc. Once documents are scanned, you can visually check documents or pages and edit them as necessary. Editing functions include reordering, replacing, inserting, and deleting documents and/or pages. In addition, entire documents or individual pages can be rotated and saved in their rotated state. Scanned documents can be quickly saved as searchable files such as TIFF, PDF, JPG, BMP, and PNG. •Place the document in the scanner according to the scanner instructions. Right click on the empty space below the list of files in list view. From the popup menu, select Scan Docs. •Scan Single File option: Select this option if you want to create single file with multiple scanned pages. •Scan Multiple Files option: Select this option if you want to create multiple files while scanning multiple pages. 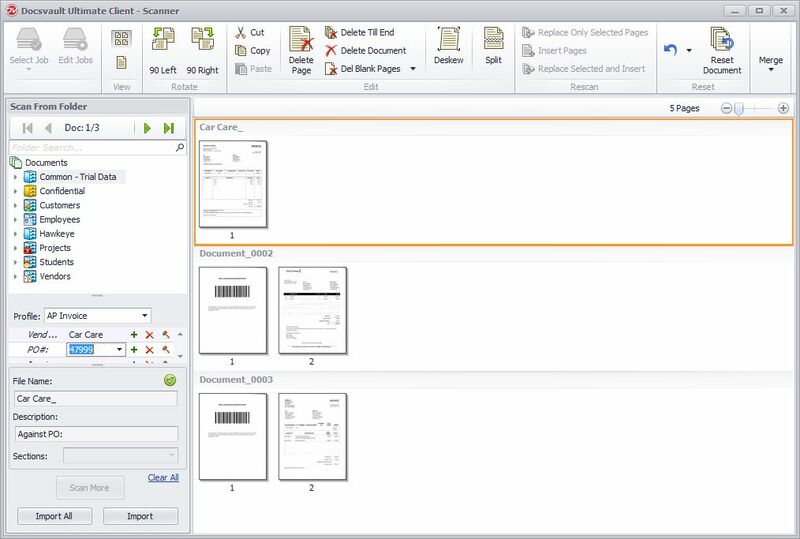 For example if you will be scanning 10 documents and you specify the number of pages per document as 2, then Docsvault will create a total of five files with two pages each. •In the File name box, enter the file name . •Saved To, browse to the folder where you want to save the scanned documents in Docsvault. •Select the Folder Sections from the list box. Note that the Folder Sections will be available only if it has been set on the destination folder. •Select an appropriate scan Profile and enter the index values. •In Selected Scanner section, select whether to use Docsvault scan interface or the scanner’s own interface. Click on the checkbox next to 'Use scanner's interface' to use the scanner's own interface. •Click on 'Change Scanner' link to select the scanner from the list. •Select the Scan Profile from the drop-down list of Scan Setting list box. Click on the Add/Edit.. link or Scan Profiles button from the toolbar to add or edit the scan settings. •Scan Profiles is a collection of frequently used settings which can be saved and reused to scan a document. Instead of specifying these settings every time you scan and save a document, you can specify these settings once and save them as a Scan Profiles. You can set the setting for example: setting the resolution, file type, selecting the source for the pages in the scanner, OCR setting, defining auto file naming and file separator for multiple file scanning etc . •Click Scan to scan the document.